SPOILER ALERT: There are episode spoilers in this review. 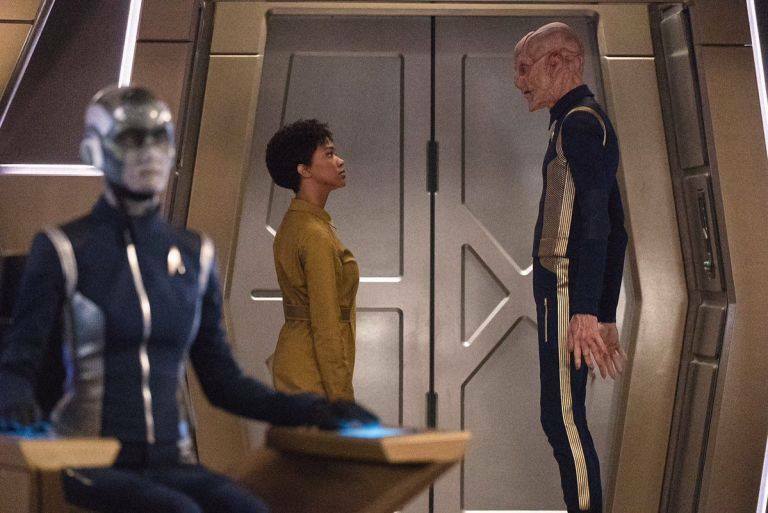 Six months after the binary star battle that started a war between the United Federation of Planets and the Klingons, Commander Michael Burnham (Sonequa Martin-Green) became a prisoner and is transported on-board a convict ship, but because of a misadventure, finds herself aboard the U.S.S. 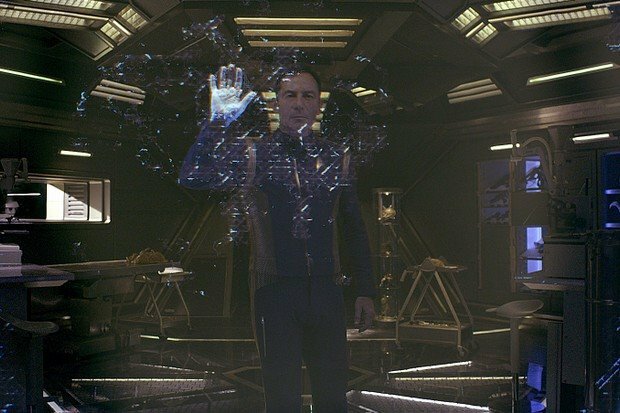 Discovery where she realizes that not everything is what is seems to be and that Captain Gabriel Lorca (Jason Isaacs) is even more mysterious than the mission he is commanded to accomplish. The beginning of “Context Is For Kings” was captivating. We open on Burnham being transported to another prisoner facility, seated among three other convicts. Two of the convicts are wholly unaware of her crimes, but can tell that she was part of Starfleet due to her yellow prisoner jumpsuit adorned by the delta badge, while the other prisoners all don grey. 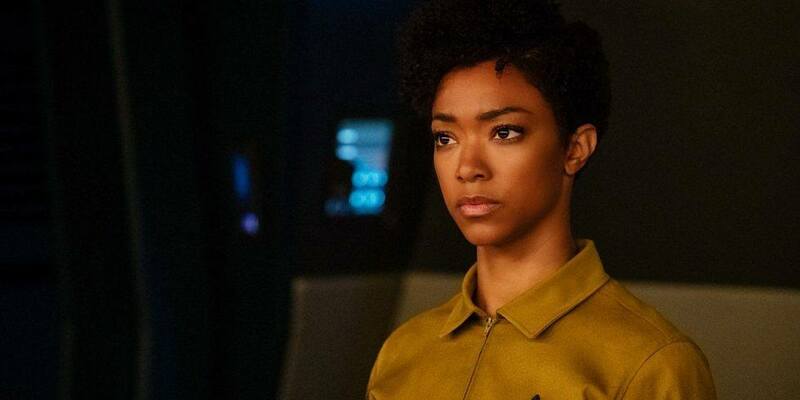 During inane conversations among themselves, one prisoner mentions that the woman in yellow used to be Lieutenant Commander Michael Burnham and instantly, we are introduced to a term we will be hearing frequently: mutineer. I wondered how Burnham would deal with being entirely stripped of her rank and her title, particularly as everything she worked hard to become burned to ashes in the last episode after she ignored her captain’s orders. At the beginning, we see a quiet, irked Burnham. But her Vulcan personality takes over hastily when the pilot drives the shuttle through a cloud of space dust (or at least that’s what we think it is) and ends up permanently deployed from the ship. Burnham reveals to the other confused and panicked prisoners that the “space dust” is actually a species of aliens that feeds on electricity. Ultimately, this means they will entirely “eat” the shuttle’s electricity until there is none left, thus leaving the convicts to die either from the lack of oxygen or the coldness of space, as there will be no more life support. The U.S.S. Discovery tracks the shuttle and pulls it on board. The first view of the starship is impressive and stunning. The amount of details and realism employed in the graphics was truly vivacious. 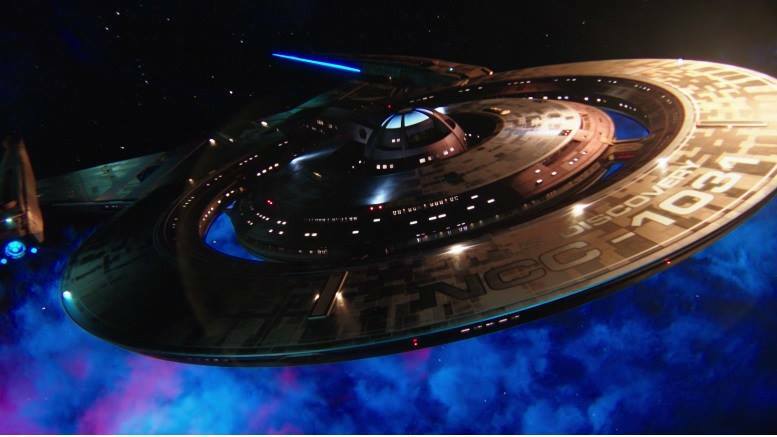 It was easy to appreciate the work put into the creation of the new starship and also obvious that the creators of the show want it to be as unforgettable as the Enterprise. When the prisoners are walked to the Mess Hall to eat, something very beguiling is pointed out by one of the prisoners: black delta Federation badges on some of the crew. This was very curious indeed and I found myself wanting to know why they were wearing those black badges. Again, I was hooked, but of course wouldn’t get my answer just yet. But I didn’t have time to dwindle as my attention was swiftly returned to Burnham becoming emotionally halted by seeing one of her old crewmembers from the U.S.S. Shenzhou, but now with half of her head shaved and a metal plate covering the shaved side of her head. Sadly, it wasn’t surprising to find her uncomfortable around Burnham. Burnham’s strength was tested in her former crewmember’s hesitance and the tension continued to build around the Mess Hall. But that’s also not so surprising when she has been so consistently referred to as the “First Federation Mutineer.” Further, no one wants to be around her, she is blamed for the war, and known across Starfleet as a rebel who should not to be trusted. Even the other prisoners do not wish to eat with her. I have to admit that I have been waiting for this introduction for quite some time now, and many might think I’m crazy, but I am a huge fan of the 1997 science fiction horror movie Event Horizon. I owe this movie my love for science fiction. I’m serious, ask me anything about black holes! 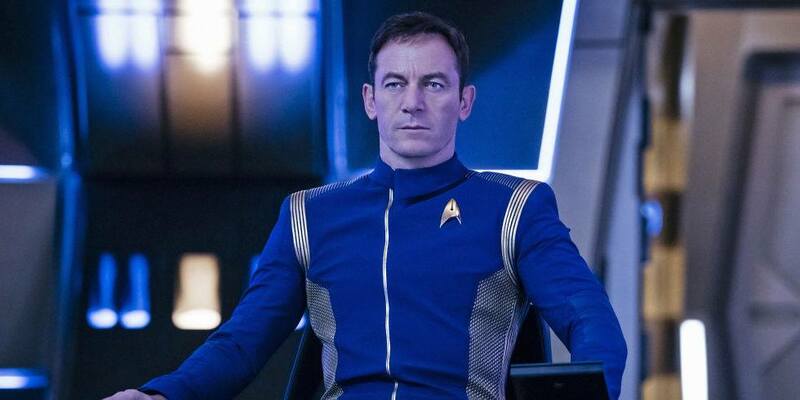 I remembered Jason Isaacs as the doctor in the movie and when I learned that he would be in Star Trek: Discovery, it was only another reason for me to watch the new series. Trust me, his acting talent DOES NOT disappoint. His voice is as mesmerizing as his charismatic eyes. Overall, he was absolutely the perfect choice for the role. Captain Gabriel Lorca is an eminently mysterious captain. Just like his ship, you cannot tell if he is good or something else entirely. There is not much said about him, apart from when Burnham is brought to his ready room. The light was very low and the first shot on Captain Lorca is a dramatic close-up on the upper portion of the right side of his face. We see his eye entirely black with what seems to be the stars from the outside window reflecting in. He explains that in a recent battle his eye was affected. In order to keep it, he had to be careful with drastic changes of lighting, which explains the dimmed lighting of the room. I am sure that Captain Lorca will become a favourite, especially thanks to Jason Isaac’s talent. As for now, I cannot say if it will be for his good or villainous intentions. 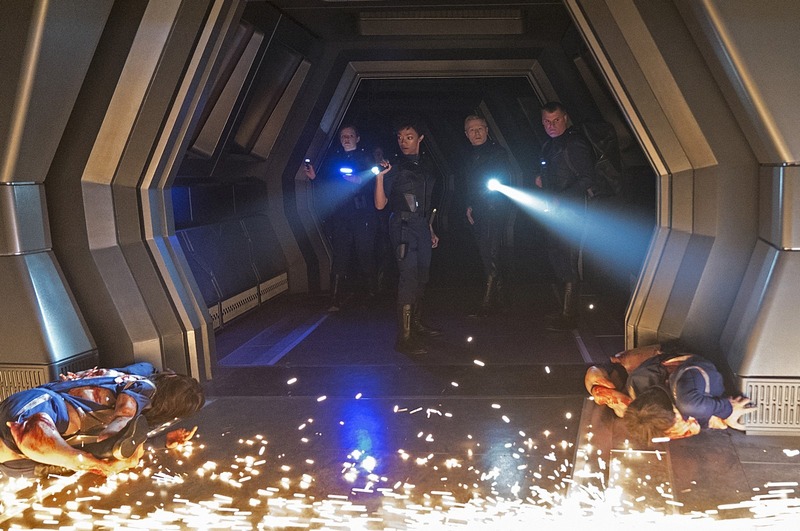 Many mysteries surfaced throughout the episode and Captain Lorca is one of the most obvious, prominent mysteries. And in case you missed it, fun fact: Captain Lorca seems to have a tribble on his desk! 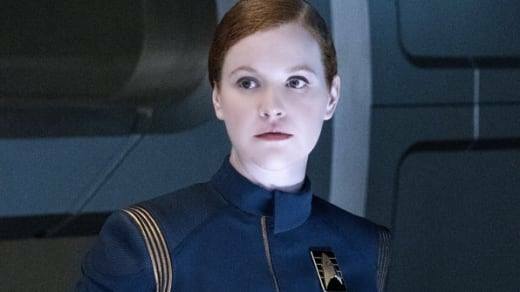 Captain Lorca made himself clear when he told Burnham that there was no such thing as a “free ride” on board the Discovery and that he would despise seeing her noteworthy talents go to waste for any reason. Burnham complied, despite her intention to stay away from the crew, knowing that many of her old teammates were reassigned on board the U.S.S. Discovery. She could tell they were all now varying degrees of uncomfortable with her presence and wished to see her leave with the other prisoners as soon as possible. And that even included the first officer, Lieutenant Commander Saru, played by Doug Jones. Saru plays a key role in the episode, even though he’s not seen much onscreen. Unfortunately for Burnham, when he is onscreen, it’s to impart brutal comments that express his disappointment in seeing such a wonderful, promising prodigy-of-an-officer dismantled by a mutiny that caused a war with the Klingons as well as the death of Captain Georgiou. 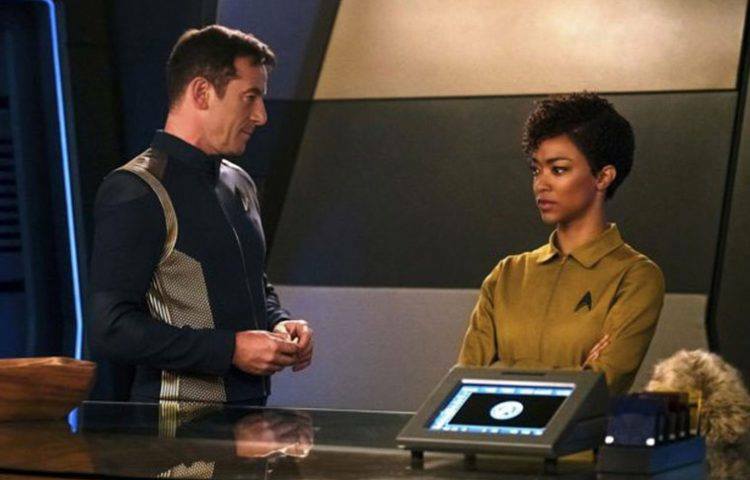 However, Saru was also the one who suggested to Captain Lorca that Burnham should participate in the away team mission, stating that she was the most brilliant Starfleet officer he had ever worked with. The away team, with Burnham on roster, voyages to the U.S.S. Discovery’s sister ship, the U.S.S. Glenn (a crossfield-class Federation starship) to salvage logs and any research materials possible. The U.S.S. Glenn suffered great damage that caused the death of the entire crew. The crew on board had been working on research so important that it was crucial the away team recovered all they could to save the study that was being conducted on their sister ship. Burnham’s following of why the ship is so mysterious left fans like me wondering more and more about the true intentions of Starfleet, the personal goals of Captain Lorca, and the intentions of a few crew members. The Glenn and the Discovery were conducting experiments on organic, faster-than-light, drive-utilizing spores from the fungus “Prototaxites stellaviatori.” The Glenn had made great advancements, even bigger than the Discovery, ultimately with the ability to jump ninety lightyears to the Beta Quadrant in one point three seconds. But one experimental jump led the Glenn to a “basidiosac rupture” that dispensed vigorous helical torsion on the ship, leaving it crippled, as well as causing the brutally distorted and mutilated deaths of its crew. When the Klingons arrive to pillage the Glenn, they were faced with a rigorous and savagely aggressive alien animal that not only killed the remaining Klingons on board, but took the life of one of the security officers’ who was part of the Discovery’s away team. Another disquieting scene was revealed after the team evacuated the U.S.S. Glenn along with the salvaged logs and research materials. The alien animal was transported on board for Captain Lorca to investigate and the Glenn was destroyed by two photon torpedoes at his command. I still enjoy the series being one long “novel,” told chapter by chapter instead of being a one-episode/one-story type of series. It refreshes the Star Trek universe and gives it a new face lift. Don’t get me wrong, TNG will forever be my favourite series, but it won’t stop me from wanting to know more about the U.S.S. Discovery. I cannot wait to have more answers about the research for the faster-than-light drive. I admittedly wonder if it will be reminiscent of the Star Trek Voyager Equinox episode when the Equinox Federation starship used aliens to boost their warp engines because of the high antimatter content stored in their nucleogenic bodies, all to help them get to the Alpha Quadrant faster. 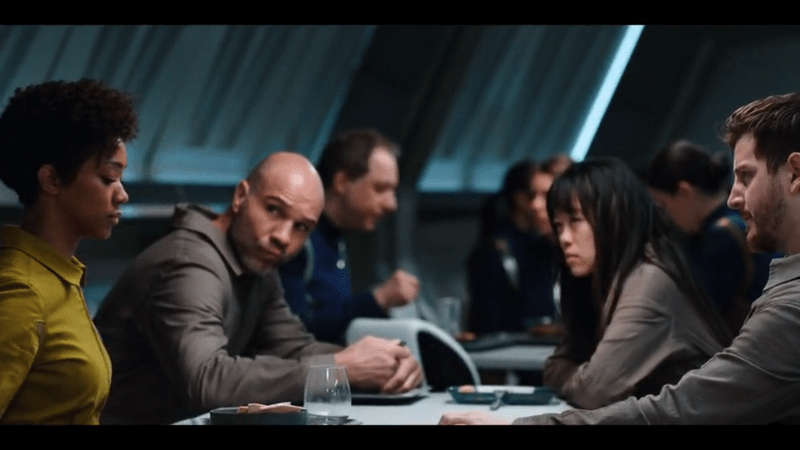 I’m also waiting to see more of Saru, as well as Burnham’s roommate, cadet Sylvia Tilly (Mary Wiseman), who reminds me of Merida from the Walt Disney movie Brave. It’s that bright smile and beautiful curly ginger hair! It’s an uncanny resemblance! Not many answers have been given, but an overflow of questions have surfaced. As ever, I cannot wait to learn more and enjoy the ride on board the U.S.S. Discovery.